Our history is what makes us a destination unlike any other. By honoring the family who preserved and made this breathtaking setting possible, we’re able to offer an incredible experience that allows guests to unwind and reconnect with what truly matters—the relationships and memories we share. Visitors to San Antonio have seen many changes over the last 25 years, but one thing that has remained constant is the beauty, rustic elegance and Texas friendliness experienced at Hyatt Regency Hill Country Resort and Spa. As the city embarks on the Tricentennial celebration of its founding, Hyatt Regency Hill Country Resort and Spa is also celebrating a seminal moment in its storied history—25 years of creating cherished memories for visitors from throughout the San Antonio community and the world. On February 24, 1993, Hyatt Regency Hill Country Resort and Spa became the first destination resort in Texas and the nation’s first resort designed around living history—the Rogers-Wiseman Ranch, a family-owned property and working cattle ranch that stretched across thousands of acres. For more than 100 years before the resort opened its doors, the Rogers-Wiseman family cultivated the Hill Country land the ranch operated on, offered true Texas hospitality to visitors and raised three generations of family members on the thriving ranch. From 1887 purchaser D.G. Rogers, to his prodigal son Henry and his wife Mary, to their daughter Blanche and her husband Papa Ed, the history of the family is woven throughout the resort. Hyatt Regency Hill Country Resort and Spa honors its heritage by maintaining the integrity and natural beauty of the 300 acres surrounding the property, and by offering a welcoming, relaxing and casually-elegant destination with world-class services for visitors and locals alike. Guests can still see the Rogers-Wiseman family influences and memorabilia throughout the property, like the original bill of sale from the 1880s and historic family photos that line the hallways, and the ranch’s ‘99’ cattle brand on jars of the resort’s house-made fire-roasted salsa. Before the resort ever opened its doors, when it was only open land full of grazing cattle, Dallas-based Woodbine Development Corporation recognized that the history of the land and the family should inform and inspire the look, feel and experience found on property. Serving as the developer/owner, Woodbine brought the resort to life in close collaboration with the family, who maintains an interest in the property to this day through the Rogers-Wiseman Family Interests. “Several decades ago, we never dreamed our early conversations with the Wiseman family would give way to a partnership that would become the foundation for this award-winning Texas resort,” said John Scovell, founder and chairman of Woodbine. Throughout its history the resort has undergone renovations and expansions to maintain the level of excellence guests have come to know and expect from the property. Today the resort boasts a five-acre water park with a FlowRider® wave machine, two-story waterslide, four swimming pools, and lazy river styled after the Guadalupe River; the Hill Country Golf Club, a sprawling 200-acre, 27-hole championship course designed by Arthur Hills and Associates with diverse terrain, lush hillsides, tree-shaded plateaus and tranquil ponds; and Windflower–The Hill Country Spa, a full-service spa set in an 1880s-style ranch house, featuring 21 treatment rooms offering a barn full of bliss to all who pass through its doors. 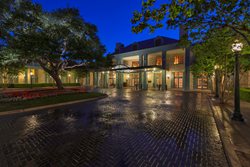 The 300-acre property features 500 guestrooms and suites that are classically styled with Hill Country touches and modern amenities, and more than 100,000 square feet of flexible indoor and outdoor meeting space, including three ballrooms and a newly-renovated, glass-enclosed outdoor pavilion. For the history of the Rogers-Wiseman Ranch and Hyatt Regency Hill Country Resort and Spa, visit http://bit.ly/HyattHC25Years. To join the celebration, engage with Hyatt Regency Hill Country Resort and Spa on Facebook @HyattRegencyHillCountry or Instagram @HyattHillCountry, or visit the property to create your own #HyattHillCountryMemories. Celebrating its 25th Anniversary, the AAA Four-Diamond Hyatt Regency Hill Country Resort and Spa is nestled upon 300 acres of the historic Rogers-Wiseman family ranch—just 16 miles from the San Antonio International Airport and famous downtown River Walk. The 500-room resort offers casual elegance and authentic Texas hospitality, while beautifully blending the convenience of the city with the peaceful charm of the Texas Hill Country. Resort amenities include the full-service Windflower—The Hill Country Spa, featuring 21-treatment rooms with world-class services, a five-acre waterpark with a FlowRider® wave machine, two-story waterslide, four swimming pools, country-style lazy river, more than 100,000 sq. ft. of flexible indoor and outdoor meeting space, and much more. A variety of excellent on-site food and beverage options are available, including award-winning Antlers Lodge, offering a unique Texas dining experience that overlooks Hill Country Golf Club, the resort’s lushly landscaped 27-hole Arthur Hills-designed golf course. Windflower—The Hill Country Spa, Antlers Lodge, and Hill Country Golf Club are available for both resort guests and the general public to enjoy. For reservations or information, contact 210-647-1234 or visit us at hillcountry.regency.hyatt.com. Or connect with us on Facebook, Twitter and Instagram. The Hyatt Regency brand prides itself on connecting travelers to who and what matters most to them. More than 175 conveniently located Hyatt Regency urban and resort locations in over 30 countries around the world serve as the go-to gathering space for every occasion – from efficient business meetings to memorable family vacations. The brand offers a one-stop experience that puts everything guests need right at their fingertips. Hyatt Regency hotels and resorts offer a full range of services and amenities, including the space to work, engage or relax; notable culinary experiences; technology-enabled ways to collaborate; and expert event planners who can take care of every detail. For more information, please visit hyattregency.com. Follow @HyattRegency on Facebook, Instagram and Twitter and tag photos with #AtHyattRegency. Woodbine Development Corporation is a full-service real estate company with more than 40 years of development, investment, acquisition and asset management experience. With offices in Dallas, Phoenix and Los Angeles, Woodbine specializes in hotels, resorts and mixed-use developments throughout the United States. The company’s hospitality portfolio features major brands, independent hotels, full-service destinations and select-service stays alike. Since 1973, Woodbine has been involved in more than $7 billion in commercial real estate projects, including the development, ownership, asset management, repositioning or renovation of over 17,000 hotel rooms. To learn more, visit http://www.woodbinedevelopment.com.